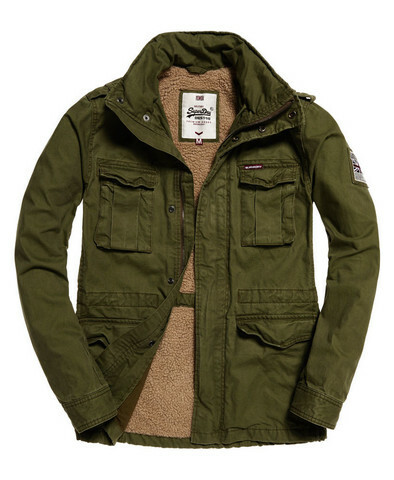 Superdry men's Rookie Field Jacket. Superdry men's Rookie Field Jacket. This military inspired jacket features a zip and popper fastening, six front pockets, popper fastened cuffs and shoulder epaulettes. The Rookie Field Jacket has a pull string adjuster inside, a fleece lining, one inner pocket and is finished with a flag logo patch on the sleeve and a Superdry logo patch on the chest pocket.